The hair growth cycle plays an important role in understanding hair loss and hair health in general. For most people, hair on their scalp grows from .3 to .4 millimeters per day or around 6 inches a year, but hair tends to grow faster during the summer and slower during the winter. There are three stages in the hair growth cycle. Some animals have all of their hair growth cycles for individual hairs synced up with the seasons, meaning that all of their hairs will be in the same stage of growth at the same time. This results in the shedding or the regrowth of their hair simultaneously. Unlike these animals, humans have a random number of hairs in any one of the three stages that varies proportionally with the length of the stage. The first stage of the hair cycle is called the anagen. It occurs when cells in papilla of the hair follicle divide quickly, forming a new hair that pushes the old, no-longer-growing, hair out of the way. The anagen phase for the hairs of the scalp lasts from 2 to 6 years, but some people have a scalps where the cycle is shorter, resulting in the inability for them to grow hair past a certain length. The hair on parts of our bodies besides the scalp such as our eyelashes, arm hair, and leg hair all have much shorter anagen stages than the hair on our head, causing these other types of hair to have a much shorter maximum length. The second phase is the catagen phase. This phase is marked by the ending of melanin production in the hair bulb and the apoptosis of follicular melanocytes. The follicle shrinks and the papilla detaches from its source of nourishment. The hair follicle ends up being far shorter than it was during the anagen phase. The catagen phase last for a shorter duration of time than the first stage; it lasts only two or three weeks. 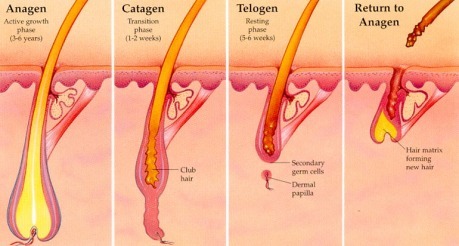 The catagen stage is often seen as a transition phase from the activity of the anagen phase to the inactivity of the final stage, the telogen phase. This is the resting phase. There is no hair growth during this time, and eventually the hair breaks from the root, falling off of your body and making room for a new hair to come in. We normally shed from 25 to 100 hairs on a normal day. 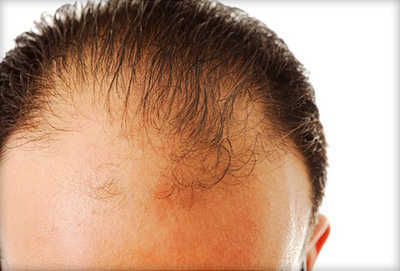 The hair growth cycle plays an important role in hair loss.